Shortly after announcing the 2017 XXL Freshman Class, which consists of Kamaiyah, A Boogie Wit Da Hoodie, PnB Rock, Madeintyo, Playboi Carti, Aminé, Kap G, Kyle, Ugly God and XXXTentacion. 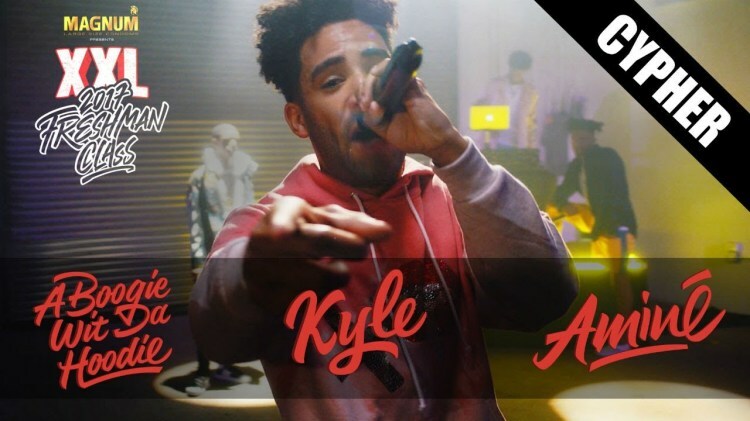 The crew is back and with the first set of Kyle, A Boogie Wit Da Hoodie, and Animé’d XXL cypher. Over production from Sonny Digital, the trio does their thing, dropping some serious bars. While A Boogie, who jumps between rapping and singing. “I had to be on that corner, until it was morning so my niggas can eat,” delivers the Highbridge the Label leader. Aminé closes it out with “Vultures at the alter, tell the pastor to watch his back/My girl said she wanted change and she got her a quarterback,” he spits. Stay tuned for the rest of the cyphers featuring Playboi Carti, Madeintyo, Ugly God and XXXTentacion as well as Kap G, PnB Rock and Kamaiyah.